Lena Levin. Sunflowers and Irises (in progress). 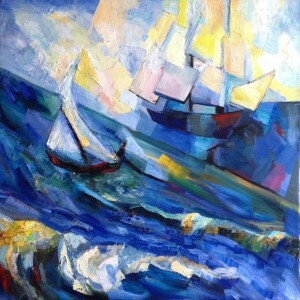 24″x20″. There was a scattered, unfocused quality to the last week in the studio, after the second sonnet composition “completed itself” so unexpectedly, leaving me without a clear plan for studio work. And this lack of focus spilled over to the practice of “studio journaling”, too. This is certainly something I’ve got to change: after all, one of the purposes of studio journaling is increased awareness of these periods of lost concentration — and if I stop doing it when such periods roll over me, it cannot really work, can it? Interestingly, this painting was nearly ready to start several weeks ago, just before the whole renovation project disrupted my life and work (sooner than expected). But when back in the studio, I couldn’t return to it right away, vacillating instead between my Rembrandt study and the rework of the second composition, “Paradox of death”. I keep marveling at how my life mirrors the sonnets I am working on with uncanny effortlessness. After all, this particular sonnet obviously refers to a long pause in the flow of sonnets, which somehow provoked frustrated questions from the addressee: where is my next sonnet? Why don’t you write? Why have you slept in my report? With the second composition complete, and the eighty third sonnet painting decidedly not ready to start spilling onto canvas, I had two options: to return to Rembrandt study (an ultimate remedy for any “artist’s block”), or to try and re-invigorate my sense of vision with some painting from life. And since it just so happened that I bought a bunch of sunflowers over the weekend, that’s what I decided to do — using an earlier (utterly failed) painting of irises as “underpainting”. Apart from just the pure joy of painting from life, without agenda or expectations, I had this fleeting idea of combining two moments in time within a single canvas — and two opposing themes of “Irises” and “Sunflowers”, both inspired by Van Gogh. 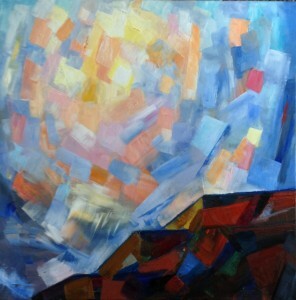 In the painting, this theme shows itself as a tension between two “styles”, two different “geometries”. 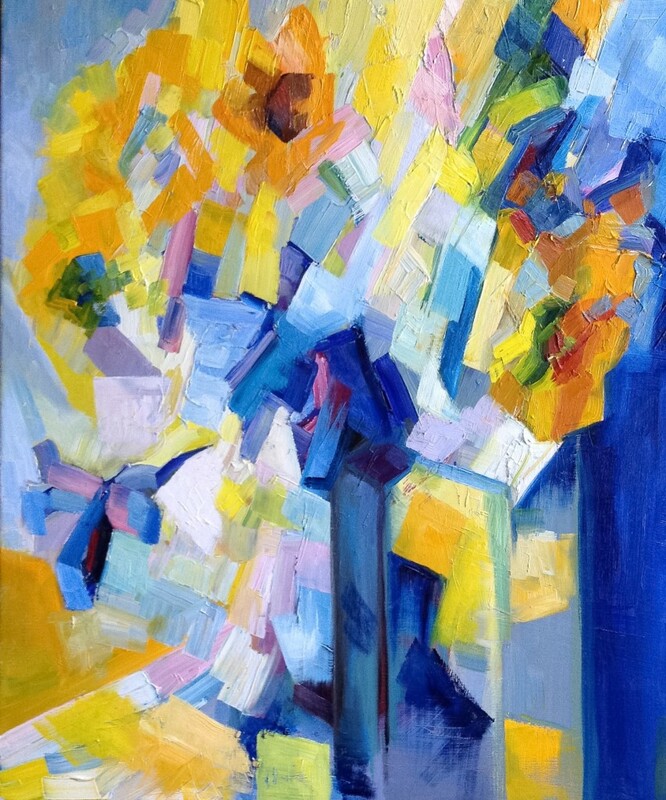 But as a lived painting experience, it was simply a tension between the existing painting of irises (representing the past), and the visual experience of sunflowers in the here and now. Although the eighty third sonnet kept reciting itself in the background of my mind, it didn’t bring me perceptibly closer to actually starting the painting. So the next day, I decided to take another roundabout — to have a closer look at the previous paintings from the overall composition it belongs to. It is supposed to be a sixteen sonnets composition (the working title is “Poet and his Muse”) and there are five completed (or quasi-completed) paintings so far. There was a hope that this experience will bring me closer to painting the eighty third, and a slight suspicion that there maybe something to be changed in these previous paintings. Of these five, it was the eightieth sonnet that (once again) called powerfully to be changed, shouting out its incompleteness, its lack of ultimate clarity. How strange that this one has turned out to be so hard, the process so long and windy — even though its visualisation is so clear and straightforward. Maybe it’s not the sonnet per se, but just repercussions from the difficult, dark months of the last fall. Or maybe this is just another case of sonnets playing havoc with my life: after all, this sonnet reaches deep into shadowy doubts in one’s artistic powers (and the fact that it’s Shakespeare, and not me, who engages in virtual self-flagellation here, doesn’t really help much; if anything, it makes it worse). And that morning, behind and beyond seeing imperfections on the surface of this painting with a fresh eye, there were two strong impulses for change. One came from the neighbouring sonnet painting, with its strong circular movement — a tangible need to support and clarify the radiance of this shape by strengthening a similar, rhyming, larger circle partially visible in this painting. And the other, more internal motivation: the need to express more clearly that, after all, it’s the poor, wretched, wrecked, saucy boat — the self-representation of the speaker — that creates and shapes the space of this sonnet and gives it its light and power (without losing any of its wretchedness in the process). In a sense, these impulses turned out to be the same, or almost the same (because it’s actually the sail of the small boat that gives shape to the circular movement linking this sonnet painting with the next one). There was a small — or seemingly small — experience during this short painting session, which seems strangely significant. At some point, I noticed a black spot — or rather couple of small spots — near the upper edge of the painting (close to the centre of the large sail). It was obviously just dirt, and so, at some point, when the painting declared its completeness (or near-completeness) to me, I decided it was about time to paint over these random spots.